A 38-year-old intoxicated man presented to the emergency department with a painful, swollen left knee and inability to ambulate after being tackled to the ground. The patient was uncooperative, and physical examination of the lower extremities was limited by his intoxication. Radiographic examination of the knee was unremarkable. Ultrasound of the knee revealed a quadriceps tendon rupture. The sonographic features of quadriceps tendon rupture are described, as is the role ultrasound plays in the assessment of a swollen, painful knee. Ruptures of the quadriceps tendon occur relatively infrequently and usually occur in older patients. Complete quadriceps tendon rupture is a disabling injury, and prompt diagnosis and expeditious operative repair is required to obtain an optimal result. 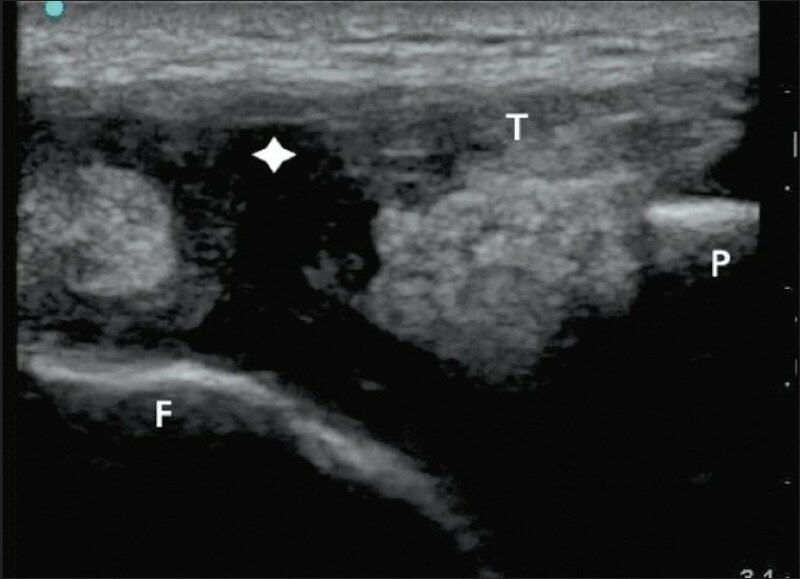 We present a case of a complete quadriceps tendon tear in an uncooperative patient using point-of-care bedside ultrasound. A 38-year-old man presented to the emergency department (ED) complaining of pain in his left knee and inability to ambulate after being tackled to the ground. He stated that he had been drinking alcohol that day and got into a physical altercation that ended when police tackled him to the ground. His past medical history consisted of schizophrenia, for which he was compliant with his medications. The vital signs were all within normal limits, and the Glasgow Coma scale (GCS) was 15. The patient appeared intoxicated and was uncooperative during certain procedures of the physical exam. His left knee demonstrated a large effusion with ecchymosis over the anterior, superior portion of his knee. Bony landmarks of the knee were difficult to palpate because of the large effusion. Distal peripheral pulses were palpable. The patient was resistant to allow both active and passive range of motion of the knee, and refused assessment for ligamentous instability. The remainder of his physical exam was unremarkable. Standard 3-view radiography of the knee was performed, which did not reveal any foreign bodies, fracture or subluxation. Given their diagnostic uncertainty, the authors performed a bedside ultrasound of the knee using a 13-6 MHz linear transducer (Sono-Site M-Turbo, Bothell, WA). 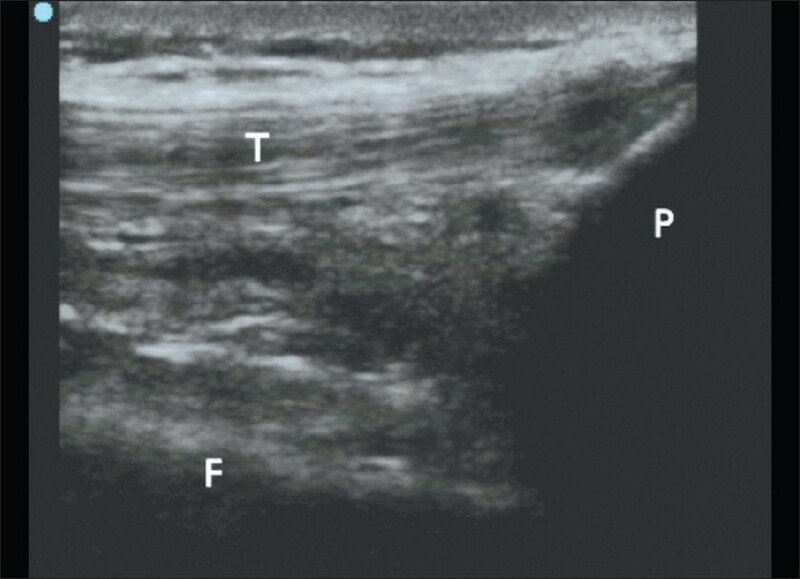 Ultrasound examination demonstrated an anechoic area at the distal end of the quadriceps tendon at its attachment to the superior pole of the patella, suggestive of a quadriceps tendon rupture [Figure 1]. A comparison view of the right knee revealed no such abnormality [Figure 2]. After the diagnosis was made, the patient was placed in a knee immobilizer; the leg was elevated; ice and analgesia were given; and the orthopedic surgeons were notified. The patient was admitted to the orthopedic service and underwent operative repair of a complete quadriceps tendon rupture the following day. The patient was later discharged to a rehab facility and had an uneventful recovery. Complete tears can often be diagnosed clinically; loss of active leg extension, a palpable suprapatellar depression, and knee pain are common findings. Partial tendon tears may be more difficult to detect since some degree of function is maintained. Misdiagnosis is common, ranging between 10% and 50%,  because the physical examination is often limited by pain and swelling. Hence imaging is often necessary. Plain radiographs are of limited utility in the diagnosis of QTR. Ultrasound (US) and magnetic resonance imaging (MRI) are more suitable imaging modalities because they allow for more detailed examination of the soft tissues. MRI is highly sensitive and specific for QTR and therefore the imaging study of choice. However, it is expensive and time consuming. Ultrasound is rapid, easily accessible and relatively inexpensive. Ultrasound can differentiate between complete and partial tears, as well as demarcate the location of the tear. , When visualizing the quadriceps tendon on US, one usually sees a 6- to 11-mm 3 thick structure with linear, parallel echoes running across its length representing the convergence of 4 muscle tendons: The rectus femoris, vastus medialis, vastus intermedius and vastus lateralis. These tendons form 3 laminae: Rectus femoris forms the superficial lamina; vastus medialis and lateralis form the middle lamina; and the vastus intermedius forms the deep lamina. Partial tears may affect single or multiple layers, while a complete tear represents rupture of all 3 layers. In complete tears, a hypoechoic or anechoic area between the tendon fibers is usually seen, and is usually representative of a hematoma. Partial tears may display a focal hypoechoic defect in the tendon. If the patients cannot flex their knee, gentle traction on the patella may lead to better visualization of the tendon defect. Ultrasound is an operator-dependent imaging modality, and tendon sonography can be technically challenging. One must be aware that tendons on US display anisotropy, and therefore the probe should be kept perpendicular to the tendon to obtain the best resolution and to avoid false-positive results. In conclusion, ultrasound is an imaging modality that should not be overlooked by an emergency physician when examining a patient with a painful, swollen knee. 1. La S, Fessell DP, Femino JE, Jacobson JA, Jamadar D, Hayes C. Sonography of partial-thickness quadriceps tendon tears with surgical correlation. J Ultrasound Med 2003;22:1323-9. 2. Bianchi S, Zwass A, Abdelwahab IF, Banderali A. Diagnosis of tears of the quadriceps tendon of the knee: Value of sonography. AJR Am J Roentgenol 1994;162:1137-40. 3. LaRocco BG, Zulpko G, Sierzenski P. Ultrasound diagnosis of quadriceps tendon rupture. J Emerg Med 2008;35:293-5. 4. Kaneko K, DeMouy EH, Brunet ME, Benzian J. Radiographic diagnosis of quadriceps tendon rupture: Analysis of diagnostic failure. J Emerg Med 1994;12:225-9. 5. Zeiss J, Saddemi SR, Ebraheim NA. MR imaging of the quadriceps tendon: Normal layered configuration and its importance in cases of tendon rupture. AJR Am J Roentgenol 1992;159:1031-4.